A passenger on board the Southwest Airlines flight that had an engine failure that killed one person last week sued the Dallas-based airline Friday for neglect, court documents indicate. Lilia Chavez accused Southwest Airlines and CFM International, the maker of the engines installed on the Boeing 737-700, of negligence and "willful, wanton and outrageous conduct." Chavez's is the first lawsuit to be filed over Flight 1380, which made an emergency landing April 17 in Philadelphia en route from New York City to Dallas. Investigators said a fan blade in one of the engines broke away from metal fatigue and debris struck the side of the plane, breaking one of the windows. One passenger was partially sucked out of the broken window, but other passengers were able to pull her back inside the aircraft. The woman, Jennifer Riordan, died of her injuries. Chavez said in her lawsuit she was sitting three seats behind the broken window and "witnessed the horror" as Riordan was pulled out of the plane. She said the blast of air from the broken window caused debris to strike her and obstructed her breathing. "This environment exacerbated Ms. Chavez's panic and horror in the midst of the violent conditions within the cabin; she prayed and feared for her life, she heard other passengers using their cell phones to reach out to loved ones to say their final goodbyes, she herself contacted her children to tell them that she loved them and that she was preparing to die aboard the crippled aircraft," the lawsuit states. The suit goes on to say that Chavez "continues to suffer severe personal injuries including but not limited to post-traumatic stress disorder, anxiety, emotional distress, depression, [and] personal injuries to her body including the physical manifestations of the emotional and mental trauma she experienced." 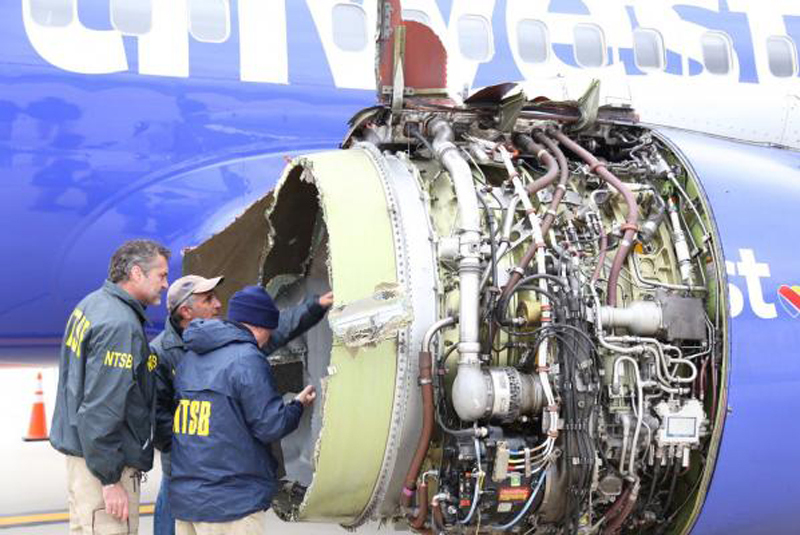 Earlier this week Southwest announced it canceled dozens of flights to inspect CFM engines like the one that failed on Flight 1380. The Federal Aviation Administration ordered all airlines to inspect fan blades on the same style of engines.